The 18th EU-Ukraine summit, held in Brussels on November 24, failed to result in strategic or momentous decisions for this country. One may rather say that the summit gave impetus to the development of a new strategy for Ukraine’s relations with that economic bloc which would take into account Ukrainian interests. After all, for the first time ever, Ukraine came to that event having met all the conditions of the visa liberalization plan, but visa-free travel has not been granted yet, and the summit saw no definitive confirmation of it happening either. It is common knowledge that the Ukrai­nian government claimed throughout the year that the EU would grant us visa-free travel, and 144 conditions set for it have all been met. But it has long been clear that this will not happen as long as the EU lacks an agreed-upon mechanism for early termination of visa-free travel. Due to a crisis engulfing the EU, approval of that coordination mechanism has stalled, and no one knows when the matter will be resolved. Therefore, granting visa-free travel has been postponed indefinitely. Indeed, the Brussels event saw signing of a 10-year memorandum, covering various fields including nuclear, coal, and gas industries and calling for an action plan to be developed jointly by Ukraine and the EU. Also, just as planned, the parties signed a separate agreement on EU assistance to Ukraine in implementing anti-corruption measures (the funding amounts to 15 million euros). An agreement on EU assistance to Ukraine’s civil service was signed as well, with funding amounting to 104 million euros). 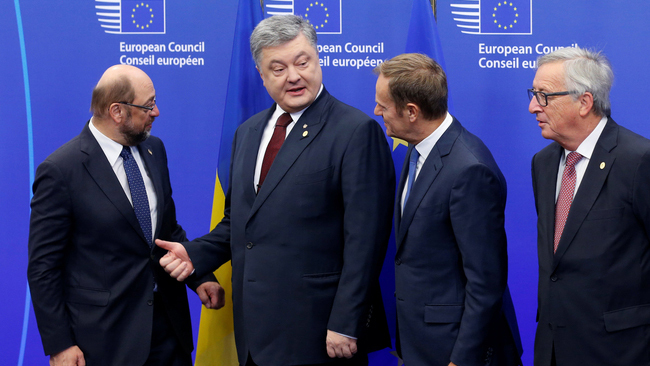 Despite the abovementioned agreements, the issue of the EU’s failure to grant visa-free travel to Ukraine looked to be the center point of a joint press conference held by President of Ukraine Petro Poroshenko, European Council President Donald Tusk, President of the European Parliament Martin Schulz, and European Commission President Jean-Claude Juncker. In particular, the Ukrainian head of state said that Ukraine was requesting that its EU partners comply with their commitments on visa-free travel. “This is the first summit where instead of the EU asking questions of Ukraine, we, the Ukrainian delegation, have asked our European partners to comply with their commitments,” Poroshenko was quoted as saying by Interfax-Ukraine. Deputy director of the Institute of World Policy Serhii Solodkyi told The Day that Ukraine had indeed complied with all the criteria for visa-free travel, and the ball was now in the EU diplomacy’s court; meanwhile, the bloc is going through a set of crises which has postponed indefinitely finding consensus on a visa-free tra­vel revocation mechanism. “Unfortunately, Ukraine has to live with these realities. On the other hand, had we not wasted our opportunities earlier, all the promises of visa-free travel made by Viktor Yushchenko and Viktor Yanukovych back in their time could have become reality. But we have wasted that time, only to enter a period of incredible concentration of these crises lately. The only thing we can do now is to show the results of the fight against corruption,” he noted. For her part, Hopko believes that in matters of visa-free travel, Ukraine must clearly approach the EU in terms of equal partnership. “Since we have fulfilled all the conditions, they must comply with their commitments without stipulating any new requirements,” she stressed. It is clear that despite the failure to obtain visa-free travel, Ukraine should continue to cooperate with the EU, strive for European standards, including standards of living, and generally enhance integration with the bloc. At the same time, as noted by Hopko, we should stop treating the EU as if we were poor supplicants, and learn to take a firm stand and defend national interests. “In the field of energy supply and energy conservation in particular, we have to show that we are partners of the EU and Europeans should take into account our interests. As for relations with Russia, we place a great importance on the EU policy of support for the sovereignty and territorial integrity of Ukraine. Meanwhile, summits are just a tool; we must see them as working meetings to which we need to prepare well and which we need to use as venues for protection of our industries and key interests. But this does not mean that we are free to stop domestic reforms and repeatedly go to the EU bodies to obtain deregulation measures for our economy. We must do these things ourselves, introduce bills, vote on them and speed up our work within the country,” Hopko stressed. As for the biggest positive of the November 24 summit, it was probably the EU’s pro­mise to maintain sanctions against Russia until the Minsk Agreements are implemented in full. “We will not leave Ukraine alone, we highly appreciate the efforts of the Ukrainian government and President Poroshenko to make reforms under very difficult conditions. Ukraine’s success will be a success for Europe as well,” Tusk stressed at the press conference held following the EU-Ukraine summit.